PHILADELPHIA — A woman who considered Johnny Bobbitt Jr. a trusted member of her charity is heartbroken at the news that he was charged with fabricating a feel-good story that put him in the national spotlight and suckered $400,000 from donors. Bobbitt, 35, Mark D'Amico, 39, and Katelyn McClure, 28, concocted the entire story of how Bobbitt, who was purported to be homeless, gave his last $20 to McClure when she ran out of gas on Route 95 in South Philadelphia last fall, according to Burlington County Prosecutor Scott Coffina. Margaux Murphy, founder of the charity The Sunday LOVE Project, told New Jersey 101.5 in August that Bobbitt was "desperate to get clean" and she was working to get him into a rehab facility. "No one is going to know where. This is not a publicity stunt. He's my friend and I want to help him," she said at the time, following a Philadelphia Inquirer report about how Bobbitt was back on the streets despite the six-figure haul from GoFundMe, which D'Amico and his girlfriend, McClure, controlled. After hearing about the charges against Bobbitt this week, Murphy said she was "beside herself." Murphy wrote on her Facebook page: "I feel betrayed, manipulated, and hurt. The thing that has not changed is my love for Johnny. Addiction has the ability to change a person completely. 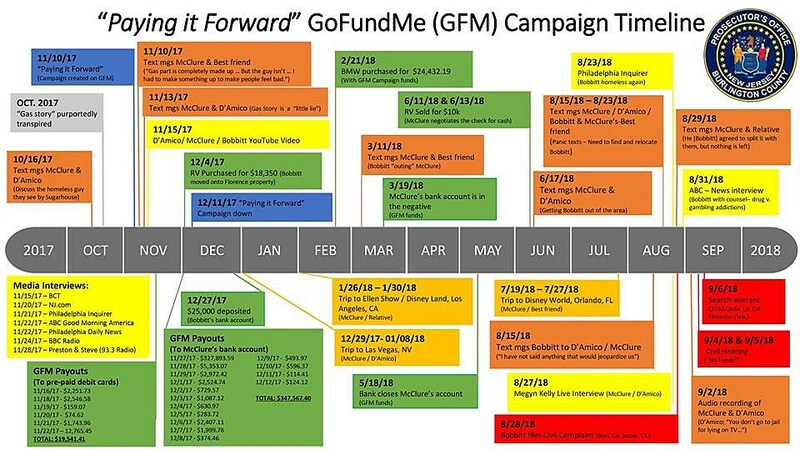 I am saddened by the outcome of this whole GoFundMe fiasco. I do not think Johnny is evil. I think he is held captive by a certain evil." After the story broke a year ago, Murphy told New Jersey 101.5 that Bobbitt "always told me he would love to start something similar to The Sunday LOVE Project when he got back on his feet." Murphy described Bobbitt as "super nice" and a kind person. "I haven't met anyone who hasn't liked him," she said. The two met when he was panhandling near the charity's office in a shopping center in the Port Richmond section of Philadelphia. After getting to know Bobbitt, she came to trust him and let him work the door at some of their events. She invited him to her house for a shower and a meal, although he didn't take her up on the offer. Murphy said that when the weather got cold last fall, Bobbitt told her he was living in a dumpster. "He told me, 'Margaux, it's not that bad because it's recycling, it's not trash.'" Her one disappointment was that when she gave him money for a bus ticket back to North Carolina to visit his family, he never bought a ticket. "I just wanted him to get out of Philly," she said. Bobbitt went public in August with accusations that the couple had kept the funds for themselves. That's when their story started to fall apart and prosecutors began snooping. Investigators say D'Amico met Bobbitt at Pennsylvania casino about a month before he took the photo of Bobbitt and McClure, which was used to illustrate the GoFundMe story. The fundraiser was supposed to raise money to help Bobbitt get back on his feet. When the hundreds of thousands poured in, McClure told reporters that they would buy Bobbitt a house. Investigators say the couple instead used much of the money to fund a lavish lifestyle, including buying a BMW and going on multiple vacations. Instead of a house, they purchased a trailer and moved it onto the couple's house in Florence. The trailer was later sold. Represented by a pro bono attorney, Bobbitt filed a lawsuit in Superior Court seeking control of the money. The couple kept up the charade, authorities said, appearing on TV and saying that they were holding onto the money for safekeeping because they did not want to provide that much cash to a drug addict. But they never provided reporters with any financial documents that accounted for the funds. Investigators say the funds had been transferred from McClure's bank account to D'Amico's. Investigators say they obtained text messages from McClure to a friend admitting that the story was a hoax. Prosecutors said that if Bobbitt had not filed his lawsuit, the three probably would have gotten away with the scam.